You + tailor + cloth. This is the essence of bespoke - a one-to-one-to-one correspondence of those key elements. You initiate the interest and desire for a bespoke garment. A highly skilled tailor steeped in a tailoring tradition creates a unique pattern and finished garment based on your figure and measurements. The cloth provides the critical, essential material for the tailor to realize the commission. Sicilian Reserve is about unbundling and delivering the minimal, essential components of heritage bespoke. It means reclaiming the critical role you play in this unique adventure. We enable you to experience bespoke without the rigidities of traditional bespoke and the inherent limitations of made-to-measure programs (MTM). Bespoke can and should be a peak sartorial experience. But rarely have the essential elements been made as personal and accessible as Sicilian Reserve. Conventional wisdom says the bespoke landscape has already been mapped out - London occupies one axis for classic structured jackets, Naples for unstructured jackets. There is nothing new under the bespoke sun. Or is there? Something has emerged, something hidden away for years. 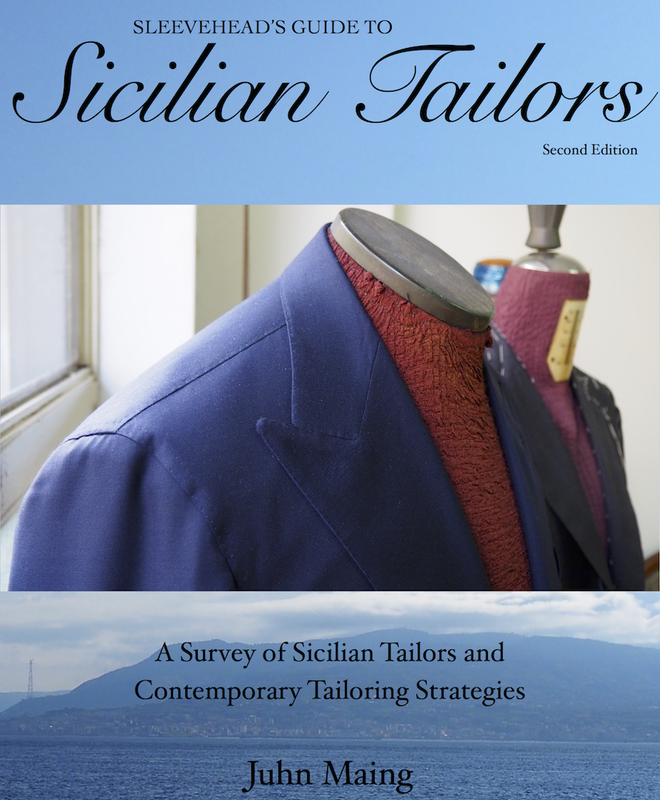 In 2011, I researched and wrote Sleevehead’s Guide to Sicilian Tailors (SGST), the first English language book on Sicilian bespoke tailors. I wrote it because I believe Sicily is the last secret left in bespoke tailoring in the Western Hemisphere. Nowhere else can you find an entire tradition of hand-made bespoke garments on par with much more well-known bespoke tailoring in Europe. Nowhere else can you find a critical mass of soft tailoring done so skillfully and moderated with such humility. This is bespoke practiced as a matter of everyday living, hidden away and largely undiscovered - a quieter luxury with craft and relationships rooted in a specific place. If you don’t know the place, you will never know its tailoring tradition. This is why very few are aware of Sicilian tailoring. These tailors truly embody local authenticity. They make clothes largely for other Sicilians; they rarely travel outside of Italy or even Sicily; and their workshops produce limited numbers of suits every year. The choice is yours. Experience the exceptional world of Sicilian bespoke tailoring. Informed by my SGST guidebook, Sicilian Reserve is a platform to help connect Sicilian artisans to overseas customers. Our primary role will be assisting tailors and artisans in their visits and trunk shows in the US and beyond. We combine your creative input in the selection and sourcing of the cloth with highly localized craftsmanship. Perhaps paradoxically, the result is a new way of experiencing bespoke that is both rarer and more accessible at the same time. With Sicilian Reserve, you have the option to provide your own cloth with the Simply Bespoke line. For the sartorial enthusiast, personally sourcing high quality cloth is often the preferred way to find the right cloth. Moreover, buying vintage or “new old stock” cloth minimizes waste. Assuming basic knowledge of jacketing and suiting cloths, you will be able to source top-notch, high quality cloth in distinctive weaves, weights and finishes, especially if you live in or near a major metropolitan area like NYC or San Francisco. If you are time-pressed or do not have easy access to quality cloth, we are able to include cloth as part of our more traditional Essential and 360 Bespoke lines as well as offer a limited range of classic cloth for your Simply Bespoke order. For new customers, we will organize three face-to-face meetings (by appointment). The first meeting involves taking your measurements and, if applicable, picking up your cloth in NYC (or periodically San Francisco). After this initial consultation, you will have two fittings in NYC or San Francisco. If you are new to fittings, we recommend reviewing the fitting process and previous fittings. For returning customers, please inquire with us to confirm availability of your tailor and whether an appointment is advisable. Follow-up orders may require a single fitting. Published originally in 2011, #SGST is the first and only comprehensive guide exploring the largely undiscovered world of Sicilian bespoke tailoring. The new 2017 expanded edition contains twice the content of the first edition. It remains the definitive reference on Sicilian tailoring whose signature is a softly structured jacket and whose heritage rivals Savile Row and Naples.